This article on electric hot water heater troubleshooting will help you to locate your 'no hot water' problem quickly and direct you to a solution to the issue. See below for guidelines on how to track down your problem. See the article on 'Gas Hot Water Heaters' if you don't have an electric heater. Common electric water heater problems are 'Replacing Bad Heating Elements', and 'Checking Electric Water Heater Thermostats'. Some common problems for all Hot Water Heaters are, 'Pressure Relief Valves', 'Leaking Water Heaters' and the 'Water Heater Drain Valve'. It could be if you do not have any hot water and you have an electric hot water heater. Sometimes the problem is too little hot water. There are a handful of items that can malfunction or wear out on an electric water heater. See if you can locate your problem and whether it is practical for you to fix it. Electric hot water heater troubleshooting involves checking wiring that has a significant amount of current. In fact the combination of volts and amps in an electric water heater can be lethal. Be Careful!! See 'Electrical Safety Tips' for information on working safely around electricity. That does not mean that this type of repair is impossible. It just means you need to have the right skills and take the right precautions. At the very minimum you want to have an understanding of what it is that needs fixed. We are in the whitewater of cost potential here. A new hot water heating unit can run anywhere from $250 to $3,500. Installation costs can run from $200 to $1,600. This is all for a new system. Yes, you may only need a $20 part. Add that to a service call and you should be looking at $100, more or less. Just keep in mind that with the potential above you might get some serious selling when you try to get someone to fix your hot water heater. Electric hot water troubleshooting starts out at a fairly difficult level. You need some testers to track down your problem. To make it worse, the testers are not that easy to use. Add to that the significant danger involved with the 240 volt power that is feeding your electric hot water tank. Check the breaker, has it tripped for some reason. The next easy thing would be the Reset button on the heating elements. Unfortunately, when the water heater is making either of these things trip, there is usually another problem. We are talking about serious electricity here. 240 volts at thirty amps. Have people been killed from that kind of current? Yes they have. Don't even look at anything unless the power is off. No hot water is a bummer and you may not have a quick fix. Assuming it is not something simple like a tripped breaker you could be looking at minimal or no hot water until you can get the problem resolved. Check the circuit breaker first. Has it tripped? The breaker for the hot water heater should be a two pole breaker in your panel. The next possibility would be an issue with the thermostat, limit switch or element. See the article 'Hot Water Heater Element Testing' and 'Electric Water Heater Thermostats' for the information on tracking down this kind of problem. Another possibility would be loose wires. Go to the article 'Electric Hot Water Heater Wiring', for direction on the wiring issues you might face. The first thing to check is the thermostat. Go to 'Adjusting the Thermostat' for a discussion. There might be problems with the heating elements, see 'Hot Water Heater Element Testing' to check and see if one or both of them are bad. Loose wiring could also cause this problem, check out 'Electric Hot Water Heater Wiring' for answers. The dip tube is another possibility. The article 'Hot Water Heater Dip Tube' addresses this problem. It could be as simple as adjusting the thermostat, see 'Electric Hot Water Heater Thermostats' for instruction. It could also be an issue with the lower thermostat or the lower element. Check out the article 'Hot Water Heater Element Testing' for more information. Another possibility would be sediment build up in the bottom of the tank. See 'Flushing a Water Heater' for information on cleaning out your tank. The top candidate for is that the thermostat is set too high. Electric water heater thermostats are not readily accessible and take a bit of work to locate. The article 'Electric Hot Water Heater Thermostats' provides instructions on locating the thermostats and how to change the settings. You might also want to review the article on 'Hot Water Heater Temperature Settings', this article provides information on how to safely set the temperature for your water heater. Next would be a malfunctioning thermostat. Another possibility would be a thermostat that is not seated properly. The articles 'Hot Water Heater Element Testing' andcover these issues. This is caused by scale build up on the elements or having the wrong elements. The elements can be cleaned or replaced. Although this cleaning them may not be worth the effort. Electric water heater elements are not that expensive, so replacing them may be the wise course. See the articles 'How To Purchase a Water Heater Element' and 'How To Replace Electric Water Heater Elements' before you decide on what to do. Low density elements are preferred and it may be a good idea just to change them when you have things apart. See 'Hot Water Heater Elements' for info on what to do. This is caused by scale build up on the elements or a dissolved anode. See 'Hot Water Heater Elements' for dealing with the elements and 'Hot Water Heater Anode Rods' for the anode rod. The water heater anode rod keeps the tank from rusting. A dissolved rod means your tank has started to rust. Replacing or cleaning the elements may also be a solution. This is caused by a build up of bacteria in the tank. Flushing the tank may help. Replacing the anode rod with a different type of metal will also help. See the article 'Flushing a Water Heater' or 'Hot Water Heater Anode Rods' to deal with bacteria in the tank or a bad anode. As the name implies, this valves releases excess pressure before it gets dangerous. When it goes bad it releases before the danger point. Issues with this item are found in ' Checking & Testing Water Heater Pressure Relief Valves'. Depending on the location of the leak, this might be a big problem. Go to the article 'Repairing a Leaking Hot Water Heater' to track down your problem. WARNING!! HOT Water, Dangerous Electrical Current and Natural Gas are used for Hot Water Heaters. BE CAREFUL!!! WARNING!!! The hot water heater elements can go bad over time and stop working. Most hot water heaters have two of them. It is possible for just one to go bad or both of them. The elements cost between ten and twenty dollars. Can you change one yourself? How do you know if it is bad? Follow the above link to get to an article that discusses the elements in detail. Find out if this is the type of repair you can do yourself? Each heating element has a thermostat that controls it. When the thermostat quits working it will not allow power to go to the heating element. The result is that you will not have hot water. How can you tell if the thermostat is bad? Is it something you can repair? Can an electric hot water heater troubleshooting exercise, identify this type of a problem? Follow the above link to get to an article that discusses hot water heater thermostats in depth. Find out if this is the type of repair you can make? How can you tell when the hot water heater element or thermostat is bad? Unfortunately, they don't have a color indicator that tells you when they are bad. Find you out what you need to test this type of device. It may be a little intimidating at first, but after you get the idea, it's not that hard. For all the latest facts on testing the components in your water heater, you can follow the above link. Don't be afraid, others have gone this way and been able to tell their stories. It is possible that your problem is in the wiring that powers your electric water heater. 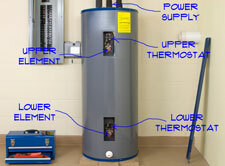 Troubleshooting an electric water heater can include taking a look at the wiring that feeds it. Caution and a healthy respect for electricity is needed. After you take a look at the information, you can decide if you want to try this. No shame in calling in the pros at this point. Learn what there is to know about electric water heater wiring by following this link. It is actually pretty simple, it's just a lot of electricity. This is a last resort when all other options fail. Or you just want to get a new electric water heater. Newer water heaters are more efficient and have fewer problems than older ones. It will take several hours and you will need some help to accomplish this task. You can save a considerable amount of money if you do the work yourself. Sediment can build up in the bottom of your hot water heater over time. This can affect the amount of hot water you have and potentially damage other components. The lower elements of electric hot water heaters can burn out due to sediment. There are steps you can take to remove the sediment. Learn what they are by following this link. Learn what you need to do to get rid of the sediment inside your hot water tank. It can be a little messy, but it will get you hot water tank working the way it is supposed to. A garden hose and a pair of pliers is all you need. Click on the link above to get to the information. How serious is it when a hot water heater is leaking? That depends a lot on where it is leaking and how much. Some things can be tightened to stop the leaks. A tank that is leaking is not good news. What's a dip tube anyway? Believe it or not, it is an important feature of your hot water tank. Find out what can go wrong with this part and what you need to do to fix it. Just take my word for it, it is important. The amount of hot water you have will be affected by it, when it is broken. Follow this link for information. The name tells you everything. When pressure builds up inside your hot water tank, this valve releases. This is a safety feature. A defective valve will release when the pressure is still within safe limits. How to you know when it is bad? How hard is it to fix? There are several possible problems you can be having with your electric hot water tank. Sorry, but there are more issues than one article can cover. We have tried to point you in the right direction for finding the answer to your problem. Some of the answers to your problem may be more than you want to tackle. On the other hand, some repairs are not that hard. You be the judge. Electric hot water heater troubleshooting involves some problems that are fairly simple. Hopefully, even if you wind up calling a technician, you will be able to discuss the problem with him intelligently. Asking the right question will often save you money.